In the life cycle of the virus, the subcellular localization of viral proteins, especially in the nucleus, may contribute to cell apoptosis, viral replication or host cell proliferation [9, 10]. Thus, determination of the nuclear localization signal (NLS) and nuclear exporting signal (NES) of a viral protein is critical, and is required in order to reveal the importance of viral proteins in virus replication in cells. Recently, three CAV viral proteins, VP1, VP2 and VP3, have been found to possess nuclear localization activity in cells [11, 12, 13, 14]. When GFP-VP1 and GFP-VP2 are transiently expressed in cells, VP1 and VP2 are observed to be present throughout the nucleoplasm . VP3 has been reported to trigger cell apoptosis, and has been found to aggregate within the nucleus by phosphorylation of Threonine 108 [13, 14]. These results suggested that a functional NLS may be present in all three CAV viral proteins. To date, the functional NLSs of VP2 and VP3 have been demonstrated via bioinformatics and biochemical experiments [12, 13, 14, 15]. VP3 contains a bipartite-type NLS and NES, suggesting potential shuttling of the protein between nucleus and cytoplasm [14, 15]. VP2 is a CRM1-independent nuclear protein with a simple NLS spanning amino acid residues from 133 to 138, and may not have a NES motif . Moreover, VP2 and VP3 expressions have indicated protein–protein interaction in the cell . Further, the apoptosis ability of VP3 is down-regulated directly by VP2 phosphatase through de-phosphorylation of Threonine 108 of VP3 . VP1 is the only structural protein of CAV, and is required theoretically for packaging and formation of infectious particles . A polyclonal chicken anti-CAV sera recognized all strains that have been tested, but only monoclonal antibody 2A9 has been mapped with VP1 [18, 19, 20]. 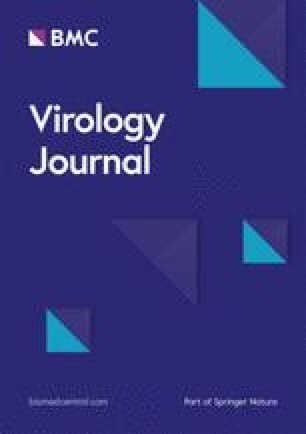 The formation of epitopes recognized by polyclonal virus-neutralizing (VN) chicken antibodies requires co-expression of VP1 and VP2, implying that VP2 acts as a scaffold protein with VP1 [7, 21]. This finding was subsequently proved by analysis of VP1–VP2 protein–protein interaction . In spite of this finding, the possible functional domain of VP1, especially in terms of the cellular localization, is not well understood, although some researchers have demonstrated the subcellular distribution of VP1 in cells using transient protein expression and immunofluorescence assays [11, 22]. The N-terminus of VP1 has been reported to possess a cell-penetrating activity . Therefore, further research into and analysis of protein trafficking of VP1 may provide more information for elucidation of the biological function of nuclear localization of CAV viral proteins in virus replication. In addition, VP1 interacts with VP2, which is a non-structural protein exhibiting phosphatase activity, and the dual specificities are indispensable for CAV replication [21, 35, 36, 37]. VP2 has been found to contain a functional NLS and is a CRM1-independent protein . Further, VP2 also associates with mini-chromosome maintenance protein 3, a component of DNA pre-replication complexes . 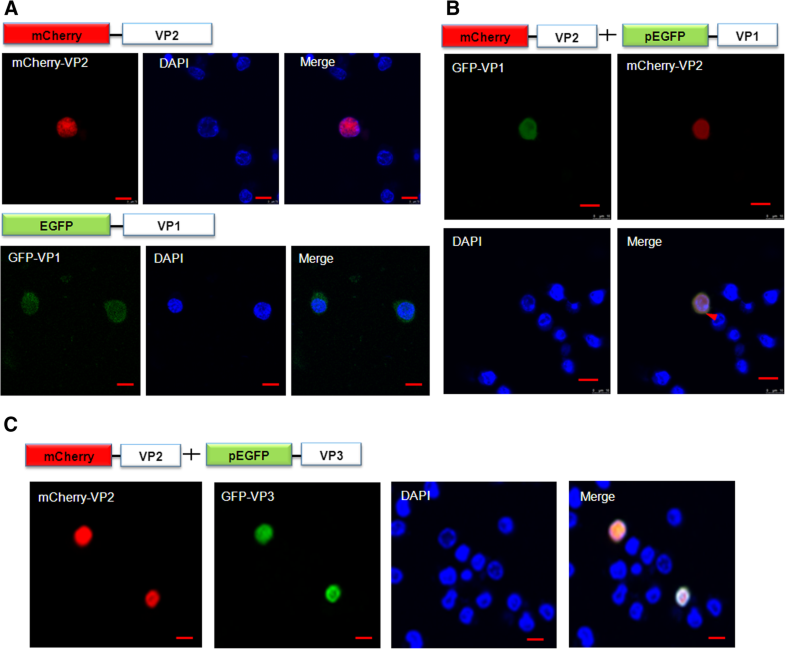 In this study, under co-transfection of VP1 and VP2, it was observed that VP2 might be shuffled by VP1 between nucleus and cytoplasm in cells. Dr. Sun reported that a specific interaction domain between VP1 and VP2 was observed by yeast two-hybrid system . As VP2 lacks an NES motif, VP1 may act as a nuclear exporting factor with VP2 for nucleo-cytoplasmic shuffling in cells. There may be other hosts involved in the export of VP2 by VP1 from nucleus to cytoplasm for regulation of the viral life cycle or hosting cell proliferation. Molecules that interact with VP2 in the cytosol require further investigation in the future.